A finance decision in only 60 seconds, whatever your financial circumstances. Our mission is to help more people find the finance deal that’s right for them, whatever their circumstances. And then help them find the car they’ve always wanted. With advice from finance experts and access to thousands of top quality cars at the lowest possible price, that’s precisely what we do. Simply fill out the application below with some basic information and press submit. 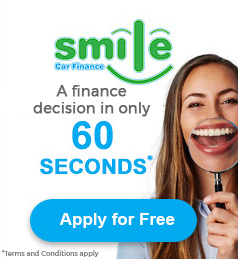 We’ll send your application to Callcredit and our partners at Smile Car Finance who will give you a decision in 60 seconds, whatever your financial circumstances. Upon approval simply visit our showroom with your relevant proofs, pick the car of your dreams and drive away SMILING. Representative example: Cash price £7,500, Deposit £0, Credit amount £7,500, 59 Payments of £167.31 & 1 final payment of £177.31, Period 60 Months, Total Amount Payable £10,048.60(Including £10 Acceptance Fee), Representative APR 12.9%. Rate of fixed interest per annum 6.77%. Applicant must be 18 or over, terms and conditions apply, guarantees and indemnities may be required.